Easter Sunday in the small town of Los Montesinos is celebrated in a slightly different way to most places in Spain. In the early hours they lay down a long floral carpet which the procession will later walk over on its way into the church. Arriving in the morning before the crowds gather gives you a chance to get a really good view of the carpet made up of all manner of flowers. In places the design is intricate, and it is certainly a fabulous display of colour. The procession begins at 11am and here you can see footage from 2016 which also includes the clean-up operation after the event. Credit goes to Kevin Smith for this. 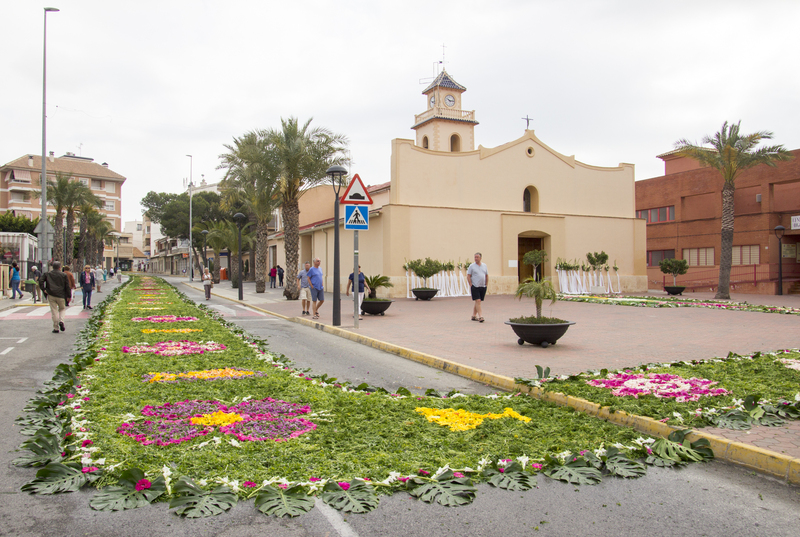 Floral carpets are common at Easter time in South America, but in Spain they are not seen in many places until the celebration of Corpus Christi, some 60 days after Easter. There is a big one in Sitges, near Barcelona. ← Albacete – the knives were out! I’ve lived here for 9 years and never new about this! Great post as usual, and stunning photos. Glad to have been of service! I’m amazed by the number of people living in the area who have never heard of this before. Montesinos never disappoints with the floral pomp & ceremony … fabulous as always ?? ?